The winemakers produce strict varietal wines using fruit primarily from McLaren Vale, fitting Tapestry's philosophy that wines should be made that truly express their varietal and regional characteristics. 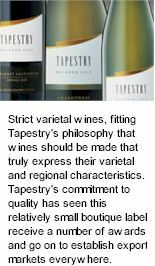 Tapestry's award winning range includes the McLaren Vale mainstay Shiraz, along with Cabernet Sauvignon, Chardonnay, Riesling, Sauvignon Blanc, Merlot and fortified wines. 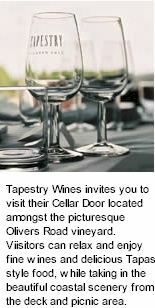 The Tapestry range also includes a collection of exceptional Reserve wines, which are produced using only the best barrels of each special vintage. The estate's history predates the acquisition of the property by the Starr family, who purchased the well-established vineyards in 1969, re-establishing the operation as Merrivale Wines in 1971. Throughout the 1970's, the vineyards were gradually developed and improved while Jack Starr became renowned for big Shiraz-pressing red wines. Reds and fortified wines were sold with growing success. The renowned Krondorf Winery of the Barossa Valley purchased Merrivale Wines as a separate entity. Charles Hargrave was appointed head Winemaker under the instruction of Grant Burge and Ian Wilson. Chardonnay (sourced from Willunga) and Riesling from the property's vines were introduced to the growing portfolio of wines. Their first vintage was processed at Krondorf Wines while the Merrivale "hollow tin shed" was being equipped for future vintages. Rapidly gaining widespread recognition, the Merrivale Winery was acquired by Brian and Kay Light who set about revitalising the old vineyard, planting 2 hectares of Chardonnay and 3 hectares of Shiraz during 1994 and 1995. This was followed closely by the purchase of a second vineyard at Bakers Gully, situated high in the hills above McLaren Vale. The new Tapestry label was also introduced, but remained as a sister label under the Merrivale brand. In 1997 the prominent South Australian company Gerard Industries purchased Merrivale Wines under the charter of the Robert Gerard AO, who remains as owner today. Since that time, this relatively small boutique label has gained widespread recognition both within Australia and Overseas, successfully establishing export markets in the USA, Canada, New Zealand, UK, Hong Kong, Malaysia and Singapore. The Bakers Gully Vineyard is located at the elevated Eastern end of Chapel Hill Road at the Southern end of Bakers Gully. Soils are sand to depth of 300 mm, followed by a subsoil of ironstone to 600 mm and over a deep red / yellow clay. Shiraz from this vineyard is used exclusively for the super premium "Vincent" Shiraz releases. Shiraz 13.4 hectares, Single cordon VSP. Riesling 0.8 hectares, Single cordon VSP. Cabernet Sauvignon 10.5 hectares, minimal hedge pruning. Chardonnay 2.7 hectares, I10V1 clone, planted in 2001, single cordon VSP, Verdelho, 2.0 hectares, planted in 2001, single cordon VSP. The wines from this low yielding vineyard are highly aromatic, showing nice menthol and mint characters. The wines are enhanced through maturation in finely grained French oaks, adding depth and structure. The Olivers Road Vineyard is located around the cellar door site on Olivers Road about 1 mile (1.6km) from the Main Street of McLaren Vale. Planted to Shiraz 3.9 hectares, 1654 clone, Vertical shoot positioned (VSP) trellis and spur pruned. Soils are dark brown fine sandy clay loam overlaying reddish brown heavy clay, and granular, light brown to red loamy sand overlaying a heavy clay loam. Vines are Chardonnay 2.0 hectares, Mendoza clone, VSP. Cabernet Sauvignon 1.2 hectares, Reynella clone, double wire vertical trellis. A new planting of 0.8 Hectares of Cabernet Sauvignon was completed in 2002), CW44 clone, single wire VSP planned.